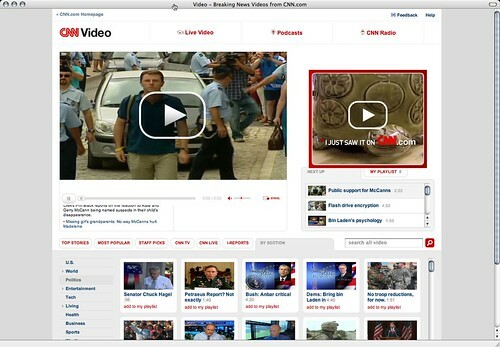 I just ran across CNN’s new website design and am pretty impressed. So many other MSM websites are cluttered and hard to use. Check out the video page. Amazingly clean and usable. The HD video content is great looking… even if I have to watch a commercial first. Can’t we get creative like YouTube and put dynamic ads you can remove after watching them? I duno… maybe this model is fine. Especially if someone makes BETTER commercials we’d like to watch. Possible? I think so. 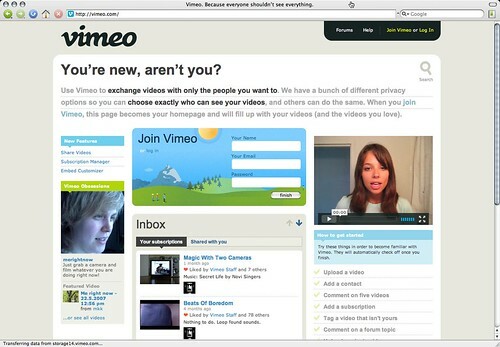 Then there is Vimeo’s new front page. Very usable and practical. If you are new to the site you can figure out what to do first. If you are a old user then you can log in and get started. Good functionality for a community website. The welcome video is an amazing mix of casual realistic style with a gorgeous actor. Notice how she adjusts the camera and the audio is not perfect? That isn’t just a “amateur” video. Its a “professional” video done with the DIY aesthetic. I’m not complaining or calling it out as sell out or something. I *love* this style. Its feels real and makes me want to watch it. A wonderful ballance is acheived and the message gets across well. I hope this new DIY Pro style (as I call it) will infiltrate successfully into TV. Right now they are aping it and not doing such a good job IMHO. Then we have Blip.tv. A good clean design that lets the main content, video, be the center of attention. I love how the video is big and promoted on the front page. It does an excellent job of showing off their communities content. Each of these sites have different purposes and goals. Though Vimeo and Blip.tv are cousins. By this I mean they both host user created video. Having used both of those sites I like Viemo the best. Mainly because of the control you have over the look of the embedded flash player. True I could put my videos on YouTube but their flash player is kinda lame looking. Viemo’s disappears after a few seconds. Cool. Overall I think the CNN website wins my mini design award. They have lots of content and make it easy to find it. Plus the designers have chosen a small color pallet with red in it. I really believe this is a KEY foundation in good usable and attractive design. SIMPLE is BEST! I’m also shocked at how a big media company has matched the design quality of small startups. In the Internet world the nimble small company usually has hipper aesthetics. (ex. Twitter) Part of the reason seems to be that startup management usually has the sense to trust designers. I think its a real competitive advantage to have a site with SIMPLE usable design.